Below and to the left, a destroyer lay offshore pounding away with its five-inch batteries, while a flight of Navy A-7s swept in beneath us, inbound from a carrier at Yankee Station. Off to the right a cloud of debris boiled up from the edge of a rice paddy east of Hue, and a little speck clawed back to the perch for a second run. Helicopters – their rotors strobing in the brilliant sun – shuttled troops from Phu Bai to a clearing in the hills near Hai Van Pass where an Army convoy had been ambushed. A pall of black smoke from several burning vehicles rose in a flaccid column, anvilling at 10,000 feet where I punctured it just for drill. High above, a Japan Air Lines DC-8 pulled majestic contrails as it bisected the isthmus on its way to Bangkok. 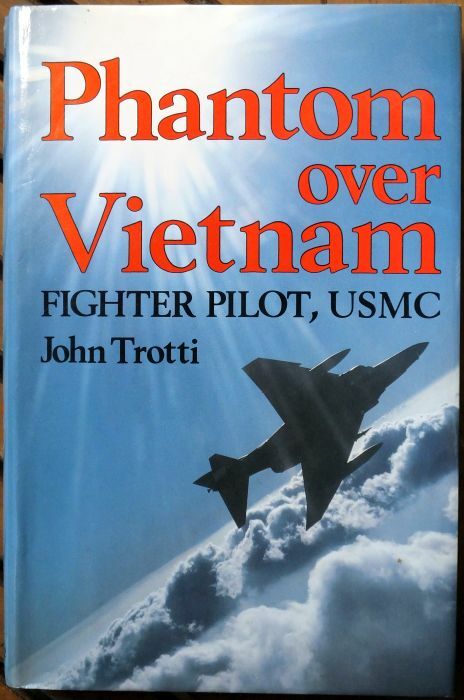 This book is full of action, relating the experiences of US Marine Corps pilot John Trotti flying the 20-ton two-man F-4 Phantom II fighter-bomber during the Vietnam War. It also contains a great deal of technical content with clear explanations that are not oversimplified. The first half of the book narrates a mission from the detailed pre-flight and start-up routine, climb out, manoeuvre to tactical spread, and so on, to landing. At each point, he digresses into the thinking behind the design of the F-4, how it handles in various configurations and at various speeds, and the pros and cons of its weapons systems. The book is illustrated with Trotti’s sketches. (Flipping through the pages, I count 11 such illustrations.) They embody an immediacy that complements the text. Those drawings appear only in the full book, incidentally. The abridged Eyewitness Nam edition (a photo of the cover appears farther on) is illustrated instead with widely available photographs. The mission he describes includes in-flight refueling, the destruction of the strike’s accompanying electronic countermeasures aircraft by a surface-to-air missile, then his bombing of an anti-aircraft gun site. In less than twelve seconds the Phantom had gone from its easterly low-level dash to its northerly 3,200-foot attack perch in a snarling arc. A dark cluster of guns slid into view just above the canopy rail, and beyond them to the left, the radar dish – my aim point. It is a classic low-level bombing run that involves rolling the aircraft on its back during the pop-up to keep the target in view, and ‘crossed controls’ when rolling upright before releasing the bombs, again to keep the target centred in the pilot’s view. Trotti precedes that action with a description of the factors that need to be considered when planning such a bomb run, even down to minutiae such as the bomb sight setting accounting for the physical displacement of the sight axis from the bomb-rack axis. …before they had even had a chance to settle their packs. I was sitting outside the Hot Pad van enjoying an uncommon afternoon breeze tinged with the smell of salt, and noticing an unusual amount of dirt and smoke just beyond the south perimeter, when the horn went off and we found ourselves banged off the pad to make bombing runs inside the normal landing pattern. The battle that follows includes the rescue of an injured crewman from a downed helicopter as seen by Trotti before and after making a napalm run along the inevitable tree line occupied by the enemy. At the end of his first tour of duty in Vietnam, Trotti took a ride in an Air America light transport aircraft, flown by one of his former Marine comrades. Trotti was astonished to learn that two of the passengers were North Vietnamese Army advisors to the Vietcong – the guerrillas fighting the Americans and Army of the Republic of Vietnam in the south. …I had gained far more insight into the nature of our hosts, as well as that of the enemy, than I had received from all the briefings and pamphlets provided by our intelligence experts. Finally, I was stunned by the realization that in the more than 100 night landings I had made at Da Nang, I had never once noticed the lights of the city. That last observation accords with those of others, which indicates to me that, the faster you fly, the less you experience. (For example, Trotti’s fellow Marine F-4 pilot Mark Stucky — too young for Vietnam — wrote that his conventional airplane flight log, documenting thousands of hours of flying time, contains ‘not a single comment’, yet he meticulously logs “…each and every hang glider or paraglider flight.”*) Nevertheless, Trotti brought back with him enough visual memories to provide the reader with several descriptions of the scenery, such as the following. 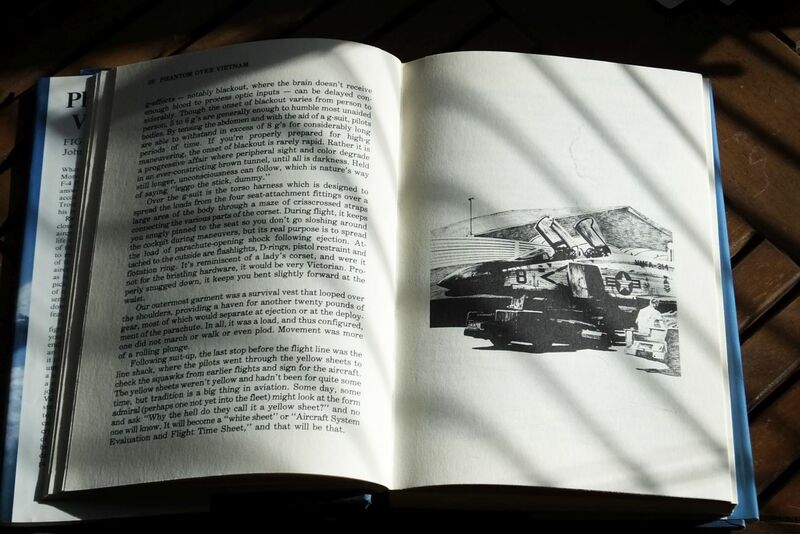 Eyewitness Nam was a series of large format books, like magazines but thicker, about the American war in Vietnam. 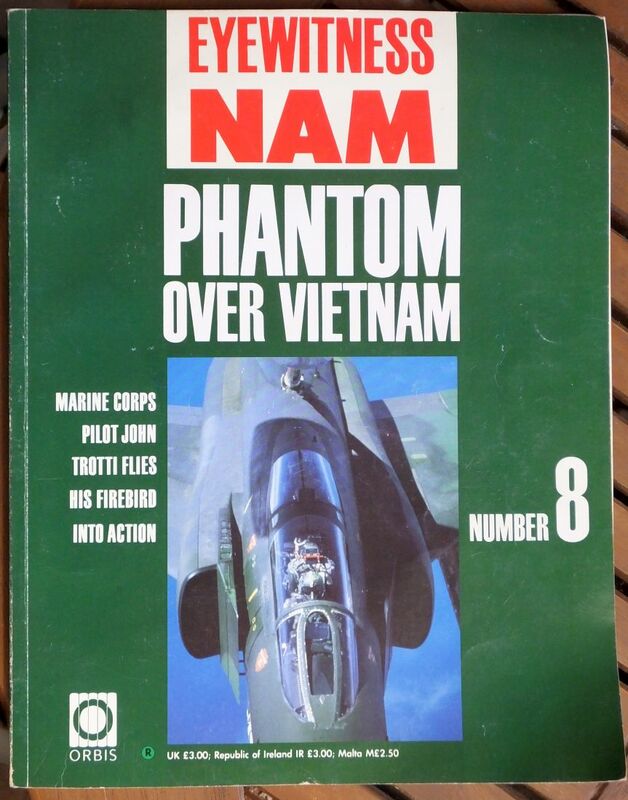 An abridged and differently illustrated version of John Trotti’s Phantom Over Vietnam was the eighth in the series. It was published in 1988. 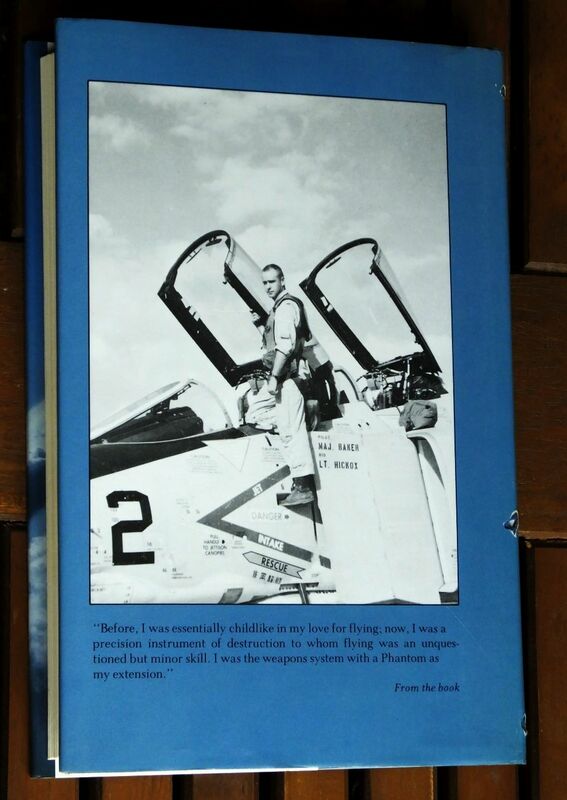 On return to the USA after his first tour of duty in Vietnam, Trotti served as a flight instructor. That part of the book describes the process of training Navy and Marine pilots up to and including landing on aircraft carriers in the two-seat Grumman TF-9 Cougar. Kerosene quickly percolated into the water table, contaminating the entire area. Whatever potability remained, the health people took care of with chlorine. It was safe enough to drink, though you felt that you ought to refrain from smoking for a while after imbibing the swill. Proficiency flying in staff or trainer-type aircraft may put a little gloss on the basic skills, but it is no help for the fact that over a period of time, one’s priorities are bound to change. Unless you’re at it day after day, the risks begin to outweigh the rewards, and what was once part of your reason for living becomes a nightmare. (Henry Zeybel makes the same point more graphically in The First Ace, a fictionalised account of air force F-4 crewmen flying from Thailand. In that story, the aircraft flown by the out-of-practice pilot is struck by a surface-to-air missile…) Trotti finds himself at loggerheads with one such ‘staff type’ who needs a DFC to ensure promotion and, to that end, he invents hostile fire from a village, which he then attacks. The center of pressure runs quickly forward, and there is just a moment of relative instability that feels like a slowing boat being swept up in its own wake. You’re quickly through it, and the handling characteristics return to their subsonic norm. It’s a situation you have to anticipate, because if you were already pulling the plane towards its structural limits, the additional loading could cause an overstress. Even in the leaden air, our twenty-ton beast had taken less than 2,000 feet of ground roll. At the instant that the shaking stopped, I rotated the gear handle up, simultaneously lowering the nose to maintain my altitude at twenty feet above the runway to remain in ground effect. In Vietnam we could do canopy rolls if we felt like it, jump the Air Force any time we wished, bounce the VNAV with our vortices when we caught them unawares, and rub bellies with a thunderhead returning from a raid into Laos. …death ceases to be the enemy, merely another participant in a game you don’t wish to end. In a sense, it showed how well we’d been programmed that we were more given to dying for our country than going home to it. No, it doesn’t. Whenever you provide anyone with the power to rate others according to their own judgement – which in subtle and complex things might not be reasonably done in any more scientific way – that individual will rate highest those who resemble (in appearance, speech, or other important characteristics) his own. Trotti’s book was first published in 1984, eight years after Richard Dawkins’ The Selfish Gene realigned popular understanding of behaviour with Darwinism, so there is no reason for introducing fictions like “the Navy way” to account for it. I am sure that Frank Petersen, who led Trotti’s squadron at Chu Lai in 1968 and became the first black general in the US Marines, would agree. Other authors do better in that regard. For example, in Boyne and Thompson’s fictionalised history of the US Air Force The Wild Blue, a main character resigns his posting as an instructor when he recognises that his own prejudices endanger the lives of his students. Indeed, earlier in Phantom Over Vietnam, Trotti mentions ‘…half a dozen other ex-Marine aviator friends whose main fault lay in the fact that they never curried enough favour among the staff types to get promoted and were forced out.’ That sounds to me (from what I read elsewhere) more like the Navy way, the Air Force Way, the Army way, and certainly (from personal experience) the way of the civilian world. Trotti’s explanations of highly technical aspects are strikingly clear. However, in a couple of places he leaves the reader to infer what is almost certainly to him obvious, but I feel it is a stretch too far for the non-technical reader. The action that John Trotti relates in Phantom Over Vietnam is the jet fighter equivalent of the helicopter war so grippingly described by Robert Mason in Chickenhawk. When I arrived for my first helicopter flying lesson, I mentioned that I had read Chickenhawk and, after a couple of questions to check that I had understood it, the instructor said that we could dispense with the briefing and we proceeded straight out to the aircraft! Reading Phantom Over Vietnam imparted to me a similar feeling; that I could jump in an F-4 and (with an instructor in the back) proceed to fly it. Robert Mason’s Chickenhawk has been described as the best book to come out of the Vietnam War and, having read it many times, that sounds reasonable to me. Except that John Trotti’s Phantom Over Vietnam is at least its equal.